The Aran Islands, in Galway Bay off the west coast of Ireland, are a unique geological and cultural landscape, and for centuries their stark beauty and their inhabitants’ traditional way of life have attracted pilgrims from abroad. The Aran Islands, in Galway Bay off the west coast of Ireland, are a unique geological and cultural landscape, and for centuries their stark beauty and their inhabitants’ traditional way of life have attracted pilgrims from abroad. After a visit with his wife in 1972, Tim Robinson moved to the islands, where he started making maps and gathering stories, eventually developing the idea for a cosmic history of Árainn, the largest of the three islands. 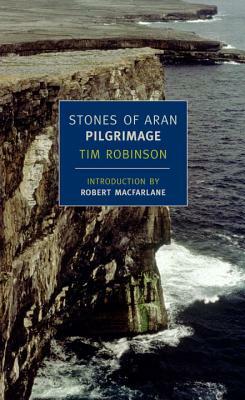 Pilgrimage is the first of two volumes that make up Stones of Aran, in which Robinson maps the length and breadth of Árainn. Here he circles the entire island, following a clockwise, sunwise path in quest of the “good step,” in which walking itself becomes a form of attention and contemplation. Like Annie Dillard’s Pilgrim at Tinker Creek and Bruce Chatwin’s In Patagonia, Stones of Aran is not only a meticulous and mesmerizing study of place but an entrancing and altogether unclassiﬁable work of literature. Robinson explores Aran in both its elemental and mythical dimensions, taking us deep into the island’s folklore, wildlife, names, habitations, and natural and human histories. Bringing to life the ongoing, forever unpredictable encounter between one man and a given landscape, Stones of Aran discovers worlds. Tim Robinson was brought up in Yorkshire. He studied at Cambridge University and worked as a teacher and artist in Istanbul, Vienna, and London. In 1972 he moved to the Aran Islands, where he gained fame as a mapmaker. He learned Gaelic and began preserving Irish place-names, winning respect as an environmentalist and a Ford European Conversation Award. Stones of Aran: Pilgrimage, published in 1985, won the Irish Book Award Literature Medal and a Rooney Prize Special Award for Literature in 1987. His other books include Stones of Aran: Labyrinth, Setting Foot on the Shores of Connemara, and My Time in Space. Robert Macfarlane's Mountains of the Mind (2003), about wilderness and the Western imagination, won the Somerset Maugham Award and the Guardian First Book Award, among other prizes. "Tim Robinson's maps and books honor the landscapes they describe. As invitations, they irresistibly beckon the archeologist, botanist, geologist, bird-watcher, folklorist, student of the Irish language, or just plain tourist." -Chet Raymo.